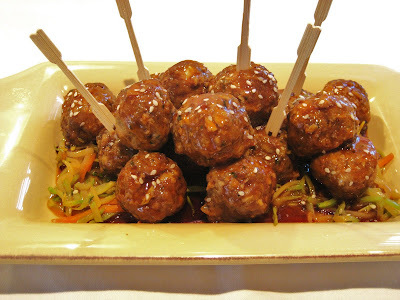 This is a great way to take a classic meatball and make it a little modern with an Asian sauce instead.....trust me......everyone will love them! I made yet, another batch of my quick and delicious Nana's Meatballs. I love making a recipe that I can use in different ways. I used half of the meatballs to have with a traditional red sauce over pasta and the other half with the Asian Sauce. I had two totally different dishes. I like serving the Spicy Asian Meatballs as an appetizer on top of a bed of this delicious Warm Asian Slaw. The next time you want to make meatballs, surprise your family and friends with a little something different. Enjoy! 1. Combine all ingredients in a small sauce pan and bring just to a boil. 2. Turn off heat and continue to stir and remove from heat. 3. 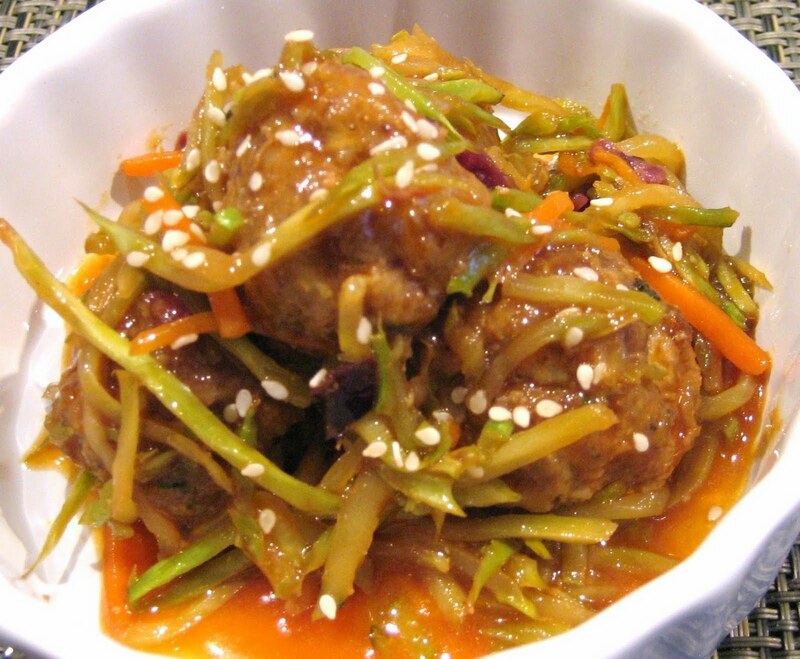 Toss meatballs in the sauce and than remove them to a serving dish on top of the Warm Asian Slaw. Pour the remaining sauce on top all over the meatballs. 4. Sprinkle a few sesame seeds on top if you desire. 5. This sauce will keep in your refrigerator for a couple weeks. 1. Saute the broccoli slaw with the butter for about 1 minute. 2. Add the Asian sauce and saute for another 2-3 minutes until desired tenderness. I like to pile the Asian slaw high and than top with the meatballs. Note: This would be great over rice too and the sauce would be nice over wings!